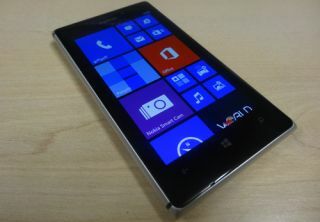 Latest Nokia Lumia 925 flagship aims for Windows Phone top spot | What Hi-Fi? The new Nokia Lumia 925, has gone on sale in the UK, taking the place of the Lumia 920 as Nokia's top-of-the-pile Windows Phone 8 device. Sporting a sleeker, lighter build than the mighty Lumia 920, the 925 sports a new metal trim – a first on a Nokia Lumia phone – around the polycarbonate back and looks to major on camera performance, particularly in low-light scenes, pitting it against the equally camera-confident HTC One. The Nokia Lumia 925 price is expected to come in around £400 for a SIM-free device, or from free with a £34/month contract. The phone has a 4.5in AMOLED screen with a 1280 x 768 resolution, a 1.5 GHz dual core Snapdragon processor and a PureView 8.7 MP main camera. Inside is 1GB RAM and 16GB or 32GB of storage. Boasting the most advanced lens technology of any of Lumia phone – Nokia will claim any phone – the 925 features six physical lenses and a new Nokia Smart Camera mode capable of taking 10 pictures at a time. Smart Camera features include Best Shot, Action Shot, Change Faces, Remove Moving Objects and Motion Focus. There's a wireless charging cover accessory, plus a selection of colourful covers, all of which are available separately. Also on board is Nokia Music, Nokia HERE Maps and the HERE Drive satnav app. The Nokia Lumia 925 will be exclusive on Vodafone if you want the black 32GB model, or on O2 for the white 16GB handset. The new Nokia is due to come to 3, EE and others later in the month. Look out for our Lumia 925 review online very soon.